My family and I enjoyed our stay. The hotel was nice and comfortable. The hotel is close to the airport.Easy to get in and out of.Nice lobby, rooms and tv set.The pizza was very good. Lobby and room was very nice. Hotel would not give me an extra night stay at my price and my room was kind of out of the way. The hotel staff was helpful and the location was perfect for my needs. Location to airport and restaurants. Passkey to enter and leave pool area. 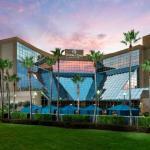 The 353-room Crowne Plaza Hotel Orlando Airport is a mile north of the airport and provides top quality accommodation at an affordable price for both the business and pleasure traveler. Items included with the room rate at this 10-story hotel are an airport shuttle, local telephone calls, in-room tea and coffee, a morning newspaper and parking. There are seven meeting rooms available for business or social events. The largest can accommodate 1,000 guests. The property is seven mile from downtown Orlando. Other area landmarks and attractions include Walt Disney World, Universal Studios, Sea World, the Orlando Convention Center, the Florida Citrus Bowl, Amway Arena, home of the Orlando Magic basketball team and shopping at the Florida Mall. All of the guestrooms and eight suites have a work desk with Internet access, coffeemaker, television with cable news and movie channels, pay-per-view movies, CD player, alarm clock, two telephones with voicemail and speakerphone, iron and ironing board and a hairdryer. Rollaway beds and connecting rooms are available. The hotels Bistro 436 is open for breakfast, lunch and dinner and room service is available from 6am until midnight. Restaurants nearby include a Bennigans, Chilis, Dennys, Tony Romas and a TGI Fridays. There is a cocktail lounge, outdoor heated swimming pool, whirlpool and a fitness center. The 24-hour front desk has safe deposit boxes and information on the Orlando attractions and events. Other amenities include a business center, guest laundry, same-day dry cleaning service, gift shop and ice and vending machines. Those who have stayed at this Crowne Plaza say it is a quality hotel with reasonable prices and a professional crew of employees that is both polite and efficient. Clients who made use of the 24-hour shuttle said it worked well and the property was only minutes from the terminal. There were complaints about the $9.95 charge for Internet access. Because of the complaints it is possible the hotel will remove the charge since many neighboring properties provide the service free. There were also a few gripes that some of the accommodation is starting to look a little dated. Despite this most clients say they will stay here again and have no problem recommending the property to others.